PX747-4K, the FIRST high brightness 4K Ultra HD home projector, projects consistent clear and bright images under any settings. Worry about lighting and shades? It’s not a problem with this projector so you can spontaneously enjoy sports and game, anytime, anywhere. 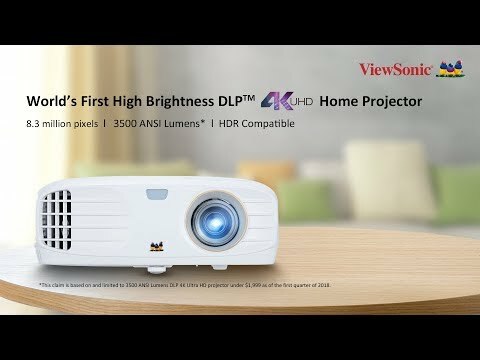 *This claim is based on and limited to 3,500 ANSI lumens DLP 4K Ultra HD projector under $1,999. Nowhere to catch games on weekends? What better place than with your friends in the comfort of your own home! Cheer on your favorite teams with PX747-4K’s ultra-high resolution clarity and immersive images. Enjoy the vivid details of true 4K that is 4X the clarity of Full HD. 8.3 million pixel clarity is supplemented by Texas Instruments’ DLP XPR technology, a perfect combination to provide you with next level clarity. With an impressive unit like this, it’s no secret that the PX747-4K is 4K UHD certified by Consumer Technology Association (CTA) standards. Get to enjoy different kinds of immersive 4K contents, like video streaming, console gaming, or TV broadcasting on the big screen. Experience larger than life, captivating images with the finest details all from your PX747-4K projector. HDR, High Dynamic Range, gives depth and higher contrast in colors. PX747-4K supports HDR contents to produce more realistic looking images and bring flat images to life with more displayable information in the darker and brighter parts of a scene. ViewSonic’s proprietary SuperColor™ Technology displays a wide color range, ensures that users a true-to-life color performance in both bright and dark environments without sacrificing image quality. A built-in 5V/1.5A USB power output can be used to power HDMI wireless dongles, like Chromecast, Amazon Fire TV stick, etc., eliminating the need for separate power adapters when streaming your favorite multimedia content. PX747-4K comes with a backlit remote control that makes operating the projector simple, especially in the dark.